It’s always been simple to get creative work reviewed and approved with inMotion’s Workflow Automation Solution – Now it’s packed with even more powerful tools to get clear, actionable feedback from your reviewers. In addition to the mark-up tools that your reviewers can use to communicate feedback on creative work, now they can also share files as part of their review. If a reviewer has design examples or alternate graphics they’d like to provide to the content creator, they can easily do that right from their review. It’s just one more way that inMotion is helping your creative team streamline the review and approval process so you can get content out to market faster! A Feedback Manager is a reviewer who can decide which mark-ups on a proof get submitted with the review. By designating a Feedback Manager on a proof with multiple reviewers, you can elect one person to resolve any conflicts in feedback or approval statuses. 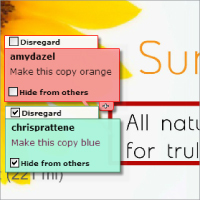 For example, if one reviewer requests that the font be changed to yellow but another reviewer requests that the font be changed to blue, the Feedback Manager can mark the first comment as “disregard” so that the designer knows to change the font to blue. With Feedback Managers, you can minimize conflicting feedback and eliminate unnecessary review cycles! An in-screen ruler makes it easy for reviewers to get a sense of scale for print and packaging design. Reviewers simply click the ruler button, select the area of the proof they want to measure, and choose to display the size in pixels, inches, or centimeters. The Message to Reviewers Box has always been a great way to communicate information to your reviewers about a proof. We’ve enhanced the Message to Reviewers Box so you can now add page-specific comments for multi-page proofs. These messages pop up automatically as reviewers navigate between pages, so instructions and annotations are always clearly provided and easy to find. Review interface enhancements will be available to all inMotion subscribers. Contact us today to learn more.